Bathe your precious skin in the essence of Organic Hibiscus Flower and discover its rejuvenating essence. This luxurious facial treatment is superior for providing a nourishing synergetic blend of ingredients known for combating the aging process. A face cream which will deliver essential nutrients to moisture starved and injured skin which has been exposed to years of harmful environmental conditions, including sun damage. It leaves skin feeling soft and supple, refreshed, toned and appearing rejuvenated. It is the perfect compliment for an overall skincare regimen when used with our Vitamin Rich Facial Serum, Perfect Balance Facial Toner and Revitalizing Cleansing Lotion. 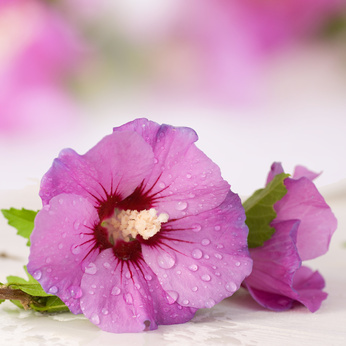 Organic Hibiscus Flower ~ This is a natural source of vitamin C with antioxidant and astringent properties. It has been used for centuries in Holistic Chinese medicine. Rosehip Seed ~ This is native to South American countries and it is an oil which is used to reduce the visible signs of aging. It is a rich source of omega-3 and omega-6 fatty acids, is high in gamma linoliec acid (GLA), vitamin C, and naturally occurring retinoic acid (vitamin A), which helps to support the skin and leave it feeling toned. According to the AMA’s committee on Coetaneous Health, emollients rich in fatty acids helps to truly make skin feel softer and smoother and reduce the appearance of fine lines and wrinkles. Ascorbyl Palmitate (Vitamin C Ester) ~ This is a fat soluble antioxidant to combat free radicals, and is known to help improve the appearance of fine lines and wrinkles, and give the appearance of a more even skin tone. It has also been shown to fight further damage caused by free radicals through exposure to the sun. This version of Vitamin C is more stable than the water soluble ascorbic acid, making it a superior antioxidant when used in skincare emulsions. Niacinimide ~ This is not subject to oxidation making it perfect for fighting free radical damage. It helps to improve the appearance of hyper-pigmentation, combats sun damage and is perfect for those with oily skin by reducing the production of sebaceous lipids. Niacinimide helps with increased skin barrier function to diminish skin irritant reactions. Beta Carotene (Pro Vitamin A) ~ Great antioxidant found in plants and is how Carrots achieve their orange shade. Fights free radical damage and is excellent for helping to improve skin condition of any skin type including rosacea and acne. Calcium D Pantothenate (Vitamin B-12) ~ Improves and increases the moisture-retention capacity of the skin (moisturizing effect), helping dry skin stay supple and elastic. This face cream is light in texture and once absorbed, will not leave a greasy after feel. It is unscented except for the slight inherent aroma of the organic oils and is highly concentrated, whereby only needing very little.